Since 1956, our goal has been to provide our customers with an unprecedented level of customer service. We do our very best to go above and beyond each one of our customer's expectations to deliver the Lester Glenn Experience, the way car buying, leasing and servicing should be. But instead of listening to us talk about the Lester Glenn Experience, we try to let our customers do the talking. Read more about what our customers have to say about their experience below! Mark and his team went out of their way to help us get the car we wanted . They are very knowledgeable , friendly and went way beyond our expectations to help in every way possible ! Seth Leifer understood my wants and needs and found the perfect vehicle for me. He was friendly and did not pressure me. This is our 5th Lester Glenn car, and won't be our last. Seth and members of Lester Glenn did everything to make leasing my new Outback a possibility. They understood my wants and needs and made it happen. They helped me out with no problem. I didn't feel uncomfortable being here as i do at most dealerships and they don't pressure you with anything! Very personable as well. Best dealership that I have ever dealt with. From the warm welcomes, to the great salesperson Seth who made the buying experience such a pleasure. Every thing went very smooth. Seth was a very good person to deal with and honest. Salesperson was very knowledgeable about the product he was selling. Good person to deal with as well as finance manger. The dealership was very presnenable. It was a good atmosphere deal with all employees. I had a great experience leasing a car here, everyone I worked with was friendly and knowledgeable. I look forward to returning when I need a new car. This was the best and least stressful car buying experience I ever had! This was the least stressful car buying experience I ever had. In the past I've always felt pressured into making a decision and it always took so long, often spending too many hours at other dealerships. 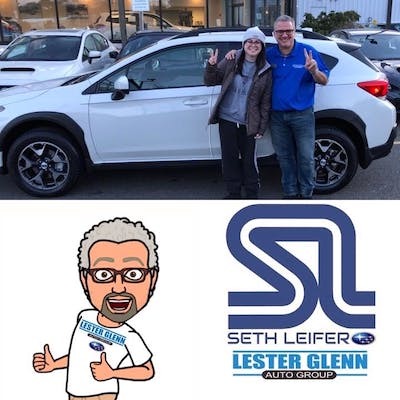 This Subaru dealership prides itself on their product and its many safety awards, so the product does sell itself, and our salesman, Seth, was very informative and paved the way for a happy buying experience. 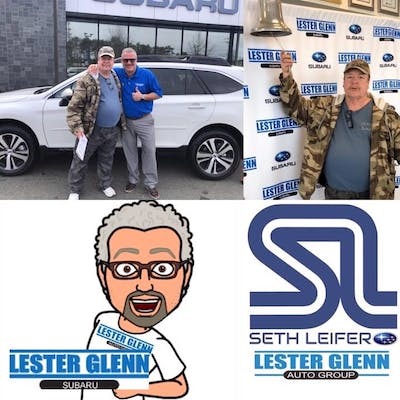 Great experience at Lester Glenn Subaru. Test drive your car, take their offer and go to lunch at Mellow Mushroom, run the numbers, then go back and buy your car. I recently purchased a car here. The entire process was simple, stress free, and fast. I would definitely buy here again. Also, I love my new outback. I purchased my new Forester through the Costco Auto Program where there is a set price. I met with the Costco representative - Ann Marie Napoli, at Lester Glenn who was very helpful and knowledgeable throughout the transaction.